Thank you for your interest in hosting a fundraiser on behalf of Ronald McDonald House Charities of Alabama (RMHCA). RMHCA welcomes our community’s initiatives to help further promote awareness and funding for our programs. Because of your time and support, we are able to provide a “home-away-from-home” for families of seriously ill children 24 hours a day, 365 days a year at our Ronald McDonald House in Birmingham and our Ronald McDonald Family Rooms at UAB Women & Infants Center (Birmingham) and DCH Regional Medical Center (Tuscaloosa). With the help of your friends, co-workers, and family, you can help make a difference in the lives of families with sick or injured children by organizing a fundraiser to benefit Ronald McDonald House Charities of Alabama. Jeans Day: Employees who make a donation to RMHCA are invited to wear jeans to work. Special Promotion: Donate a portion of all sales of a select item. Tournament: Organize a softball, golf, kickball tournament and donate entry fees to RMHCA. Food Festival: Organize a chili cook-off or BBQ block party with your friends and neighbors. Challenge Drive: Display an RMHCA collection box and inform your customers that you will match a portion of funds donated. In Kind Donations are welcome! Change Drive: Employees collect loose change over a period of time and donate it to RMHCA. 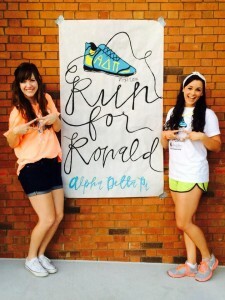 Fashion Show: Organize a fashion show with your friends, like Samford’s Alpha Delta Pi Sorority. If you or your organization would like to host a fundraising event to benefit Ronald McDonald House Charities of Alabama, please complete the online community fundraiser registration form. Do you have questions? Here are some people to contact to help you get started. Prior to your event, a required approval from RMHCA’s Chief Executive Officer is needed in order to proceed with the event using our logo or mentioning our organization. Once your application is received expect a response within 2 working days.